The Altered:Nozzle Dual Flow Pro is designed for everyday efficiency. That means saving water without wasting time or losing functionality. Experience mist with our patent pending atomization technology. Millions of droplets instantly drenching your hands. Making it possible to give you 98% less without loss. Full functionality with our Spray Mode. If you need more, you'll get it. Just turn the handle and our spray mode will fill your glass instantly. Still saving 85% compared to regular taps, but still all the water you need. The Altered:Nozzle Pro is made in high precision turning machinery with Ecobrass from Wieland. 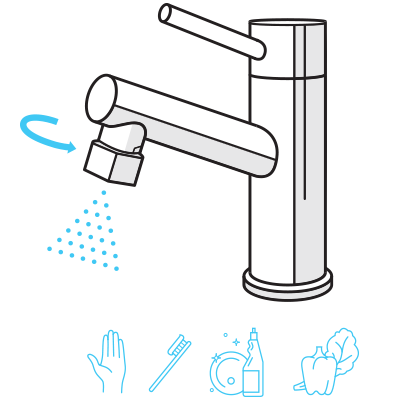 Perfect for washing your hands, brushing your teeth and washing dishes and greens. Simply unscrew your existing aerator and insert the Altered:Nozzle. Fits Standard, Junior and Tom Thumb sized taps. Watch and see our comparison between washing hands in 0,2 Liters/Minute with the Altered:Nozzle and a regular flow with a standard faucet of 12 Liter/Minute.